I was unfortunately thankful to get a blister on the back of my foot. (I never thought I would say such a thing. Guess I was excited to give the Blister Treatment a go!) I went ahead (the morning after I gotten the blister) and followed the instructions making sure the blister area is clean, dry and free of creams and oil. I then applied the cushion, within hours my blister wasn't in burning pain. I continued on with my day and by the end I nearly forgotten I even had a blister. The only thing that reminded me was the cushion left on my foot. And because you're suppose to leave the cushion in place until it starts to detach, I didn't have to worry about what was happening for (3) days! Once it started to detach, removing the cushion was painless. All that was needed to be done was simply stretch the cushion along the skin slowly. Surprise!, it did not leave any residue as sometime bandages tend to do and my blister was no where to be seen! The Polysporin Blister Treatment is available in 3 different cushions: small (6), medium (5), assorted (5). And the packaging is a perfect size to fit just about anywhere, even inside a small clutch! Overall, great product, worth every penny. It heals a blister quickly and efficiently versus applying ointment and replacing a bandage daily. 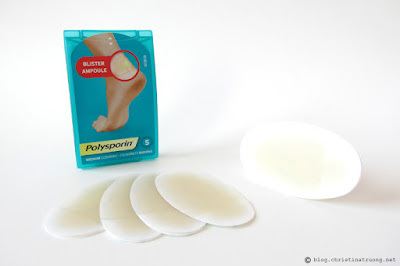 I would truly recommend this to anyone who suffers from blisters! Disclaimer: Product received complimentary from ChickAdvisor for testing/review purposes. Views expressed are of my own.